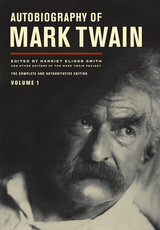 Mark Twain is on fire! His unexpurgated Autobiography debuted at No. 2 on the New York Times Nonfiction Best Sellers list—”not bad for a book written 100 years ago and wrapped up in canny posthumous mythmaking ever since,” writes the Times in this week’s “Inside the List” column. You can read excerpts from the Autobiography online at The New York Times. Celebrate with UC Press, Litquake, the Bancroft Library, and the California Historical Society tonight at 7:00 p.m. at the first-ever Mark Twain Ball, where we’ll indulge in costumes, mustaches, special cocktails, period music, and possibly some more posthumous mythmaking. You can still buy tickets at the door—so come join us!